The polar bear reproduction likely occurs in days when the seals are abundant. They will reproduce in March or mid-April to May. A male bear will begin tracking the female 100 kilometers far off via smell. Once male gets to the female it insists his partner to mate. If a male finds another wandering male both fight over the female. The fight is not intense as much and the less dominant male usually withdraws. The winner is going to mate with the female. 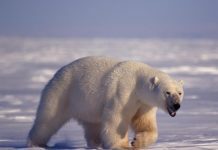 In this article you’ll come to know how do polar bears reproduce in the Arctic tundra. 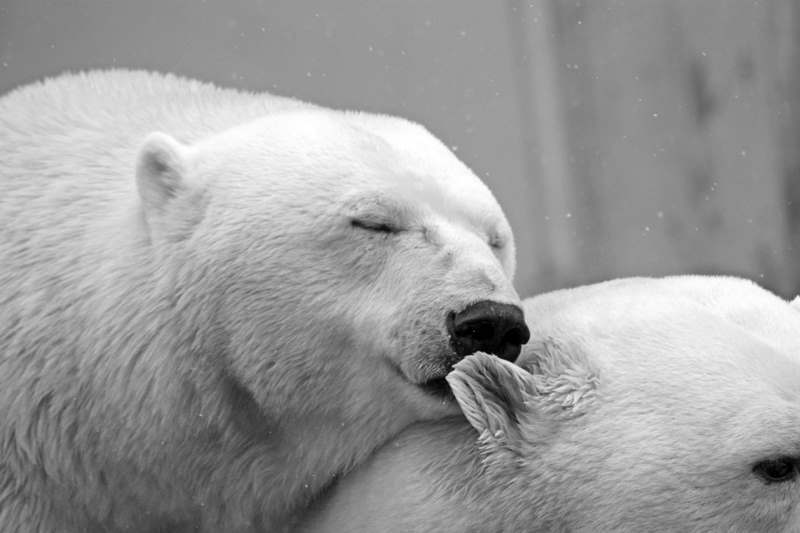 Polar bears are polygynous creatures in that their cubs may or may not belong to the same father. The mating partners however live and eats together for as long as 10 to 14 days. During these days ovulation occurs many times. Once the female gets pregnant she eats a lot of food and tries to gather as much fats as she possibly can. The pregnant mother will put on weight almost equal to that of an adult male. 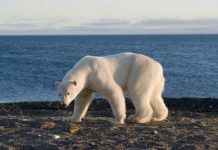 Let’s get on with some of the most interesting facts about the polar bear reproduction. 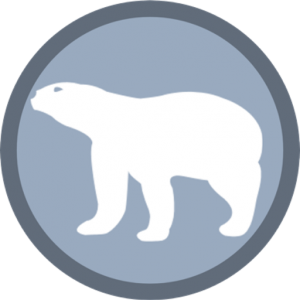 The reproductive biology of a polar bear is not quite different from other bears. Polar bear’s estrus cycle ranges from March to May but the peak days begin in the first week of May. Coitus is most likely to stimulate ovulation. The fertilized egg is thought to be suspended until autumn. The gestation period of a polar bear is 195 to 265 days. Cubs are typically born in January but they may not come out of den until March. 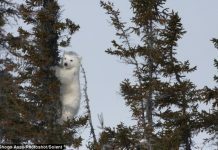 The average number of cubs is two but three are also common across some of its range especially in Hudson Bay. The weaning period ends in spring and the cubs become independent at the age of 2.3 years age. The female may not breed again until the end of lactation period which lasts for about 2 years. The reproductive interval in polar bears is 3 years. Read More: How Many Babies Can a Polar Bear have at Time? Newborn cubs weigh up to 0.6 kg at birth. They are born blind, hairless and toothless. However cubs may gain weight in a few days up to 10 – 12 kg. They will leave the den after achieving 12 kilograms of weight. The weight continues to increase quickly until the cubs turn one year of age. The mother will nurse their young with fat-rich milk. Female polar bears are thought to possess the most nutritious milk of all carnivorous mammals. The nursing peaks in the first year after birth but it gets low in the second year. The birth doesn’t appear to occur in the same month throughout the arctic. 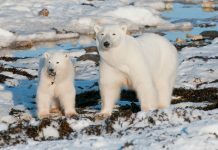 In the Hudson Bay cubs are born in mid-November to mid-December. In some regions the birth occurs in the last days of November. 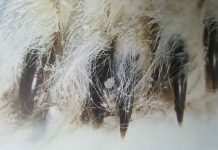 In the Beaufort Sea female bears mostly enter into the den in the early December. In captivity the birth may occur as late as in December 27. The female body condition determines the timing of implantation. Male bears become sexually mature at 3 years of age but they are able to breed for as long as 19 years. Normally males attain maturity at 3 – 5 years age. The abundance of ringed seals primarily defines the productivity in polar bears. The greater is the number of seals the shortest is the reproductive age. 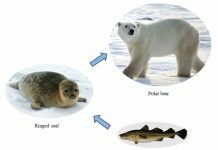 In the Beaufort Sea, the ringed seals are not abundant as much and thus the bears attain maturity at 5 years of age. The female will give her first birth at 6 years age. In the Canadian High Arctic ringed seals occur in high densities. As such females breed at the age of 3 – 4 years of age. Read More: When Do Polar Bear Cubs Leave their Mother? The number of cubs born is thought to decline as the bear attains 14 years of age. Females are least likely to complete their reproductive cycles before 3 years interval. The interbirth interval increases with the increase in nursing. If the weaning period is about 2.3 years (mostly) the birth interval goes up to 3 years whereas if the weaning completes in 1.3 years then female is able to breed again after 2 years interval.